HomeBlogReTree the DistrictHelp ReTree the District Thrive in 2018! ReTree the District is a community development initiative in Buffalo’s University District that has planted more than 1,000 trees across the community. The project is reinvesting in our urban tree canopy, restoring our parks and greenspaces, encouraging hands-on volunteerism, strengthening ties among neighbors. 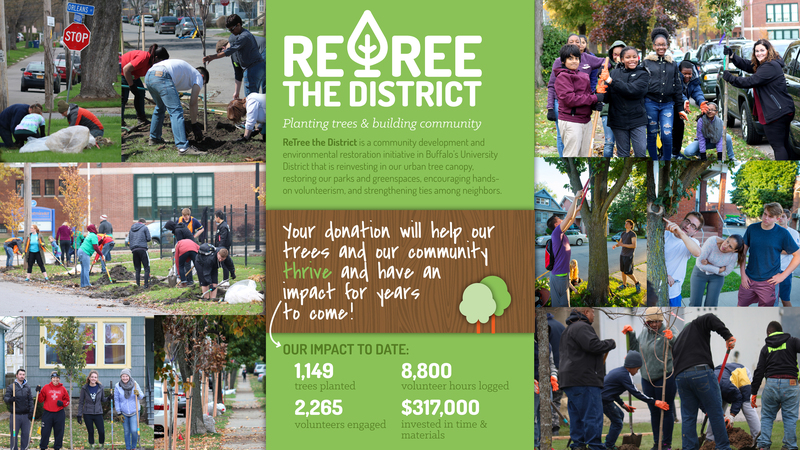 Started in 2014 by a group of community partners in Buffalo’s University District, ReTree the District was a response to the significant loss of street trees along neighborhood streets from disease, weather, and age. The goal was to plant 1,000 trees across University District over two years. To date, the project has planted 1,149 trees and continues to plant over a hundred trees each year with the goal of a fuller and healthier tree canopy. Taking into account total material costs and the value of volunteer hours, ReTree the District has resulted in a community-led investment of over $317,000! Now as we embark on a new year of planting trees and building community, we are asking for you help in adding another 100 trees to our urban forest in 2018. At a cost of $100/tree that’s $10,000, which seems like a mighty ambitious goal, but the impact of your $100 investment will result in thousands of dollars of social and economic benefits for generations to come. Invest in a greener future by investing in ReTree the District and help sow the seeds of a tree whose shade you may never know.